Today's post is brought to you by magic! And it was supposed to be brought to you last week for Halloween but alas it wasn't (and originally drafted in September). Harry Potter needs no introduction so where to begin with the Harry Potter series?! I'll start with why we're sharing it on the blog today. It is tagged as a "wellness" post. Harry Potter gave us much to look forward to throughout the year. We started reading more at night and turning off the television. And then ironically we switched back to watching the television as we viewed each movie. Our intellectual wellness increased as we were choosing to read nightly. And I would argue that viewing the movies was a benefit to our social wellness. The social wellness argument might be a little hard to make since we only viewed the movies with each other but it did allow us to strengthen our relationship. We would set aside a weekend night (typically a Friday) for a Harry Potter viewing and made it special. These date nights included a quiet dinner at home with some wine and then our feature movie for the evening. Even though we were watching television we weren't aimlessly watching reality shows. 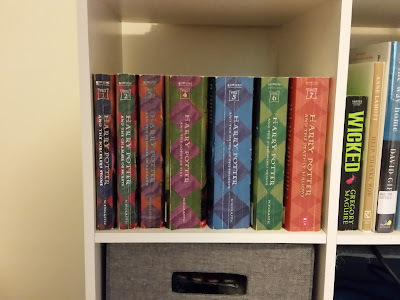 Confession time: I had never finished the series! 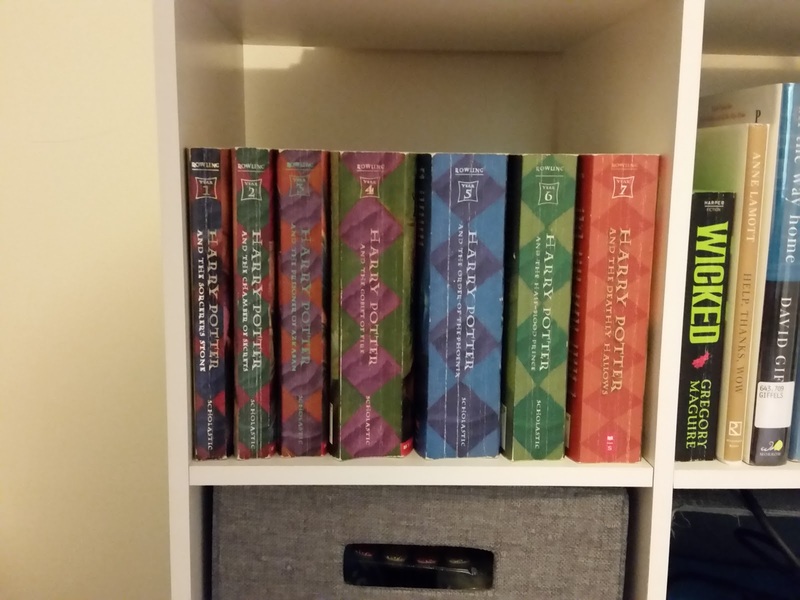 As a teenager I read the Harry Potter series as the books came out (each about a year apart). Well by the times the latter books were getting released I was having a hard time remembering plot details from the earlier books. So when the final Book 7 was released I decided to reread the series and finish with the culmination of reading Book 7. Somehow that never happened! I dropped off somewhere before Book 4. The series set you see above is mine and has always been sitting on a bookshelf taunting me to finish. I set out to complete my goal at the beginning of this year. As I began reading the first books Patrick took notice. And guess what?! Confession time: Patrick had never even started the series! Imagine my surprise. So he started reading them too. Night by night, week by week, and month by month we read Harry Potter. And then we were both on par with the cultural phenomenon (and actually knowing what happen with Lord Voldemort). Next up was tackling the movies. As mentioned above we watched them when we had a free weekend. We actually rented the DVDs from the library! Score for utilizing our local resources. Finally my open book of Harry Potter could be closed. I asked Patrick if he had any thoughts to share for Wellness Wednesday in regards to Harry Potter. Here is what he had to say: "While I didn't have rave reviews for all the books, it did introduce a new habit of reading before bed that I really enjoyed and have kept up since. Reading the books and especially watching the DVDs were fun things to do with my wife." Did it improve your wellness and affect your quality of life?! "Yes. Reading books is more enriching and fulfilling than playing with my phone, and is better preparation for sleep." And that's it folks! The message today is go read a book ... and make it Harry Potter if you never actually read that too. I agree. I love to read.